Idesa Sadri is a Dunmer citizen living in the House of Clan Cruel-Sea in Windhelm and is the sister of Revyn Sadri. She assists in the upbringing of Hillevi and Torsten Cruel-Sea's son, Grimvar Cruel-Sea. 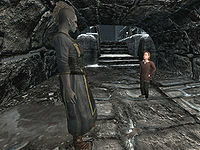 When you first enter Windhelm, you can find her near the Aretino Residence, trying to convince Grimvar not to talk to Aventus Aretino. After having this conversation, she will begin her normal schedule. She will spend most of her time at her employer's home, beginning her day there at 7am by getting out of bed. She will spend most of her day with Grimvar. At 8am, she will have breakfast with him, then she will spend the next three hours by his side in the house. After that, she will stand around the house until 6pm, when it is time for dinner. On Mordas, Middas, and Fredas, the two will eat at home. However, on Tirdas and Turdas they will instead go out for a meal at Candlehearth Hall. On the weekend days of Loredas and Sundas, the two will forgo dinner, instead just hanging around their home. The weekend is also the only time Idesa will leave Grimvar's company. She will head down to the Argonian Assemblage at 11:05pm until midnight. At midnight, on every day of the week, she will retire to her bed in the House of Clan Cruel-Sea. She will wake up at 7am the next day to go about her business. Idesa wears a set of merchant's clothes along with a pair of boots. She wields an iron dagger and carries her house key and a selection of common loot and gold. Idesa: "All right. I won't deny it, child. What you heard is true. But Aventus Aretino walks a dark path. His actions can lead only to ruin. Now. Enough. We will speak no more of this. I am the only friend you need." If you talk to her afterwards about the conversation, she will tell you: "Hmm. Yes, it is quite sad. A young boy, Aventus Aretino, lost his mother recently, and was sent to an orphanage. But he has returned home, and people have heard strange chanting. They say it's the Black Sacrament, the ritual to contact the Dark Brotherhood. Why a little boy would want to contact a group of murderers is beyond me, but he is inviting evil into this city." Idesa Sadri will make numerous comments about her job taking care of Grimvar. She will make a remark about the various dangers current events present to a child: "I try to keep Grimvar safe, but these are dangerous times." She will also briefly speak about the general struggles brought on by child rearing: "Ever tried taking care of children? It can be a nightmare." Idesa will also bring up the recent killings in Windhelm, as part of Blood on the Ice: "When Grimvar asks me why women are being killed around the city. I don't even know what to say to him." While at the Argonian Assemblage, she will also state how she occasionally brings Grimvar there to humble him: "I like to bring Grimvar down here sometimes. It reminds him how lucky he is." Numerous aliases within the Creation Kit suggest that she could have been originally intended to be an Argonian named Sings-of-Dreams. This is further suggested by her visiting the Argonian Assemblage. 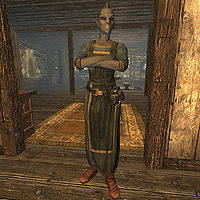 While it is confirmed that she is the sister to Revyn Sadri, she also shares her surname with Feran Sadri, Geldis Sadri, and numerous other Dunmer from Morrowind and its expansions. Idesa will state she brings Grimvar down to the Argonian Assemblage, but she never does this. This page was last modified on 12 November 2013, at 04:13.